On April 9, Spain saw its very first fully electric passenger bus hit the ramp at Seville airport. The bus was the culmination of a collaboration between ground handler Aviapartner, its equipment lessor, Air Rail, the airport authority of Seville (AENA) and Chinese bus manufacturer Yutong. The new bus was announced by Aviapartner CEO Clive Sauvé-Hopkins, together with the company's General Director for Spain, Steve Azevedo, as well as Air Rail’s General Director, José Manuel García Prieto and CEO of Air Rail, Luis Yagüe. Also at the inauguration was Seville's Airport Director, Jesús Caballero. A product of Aviapartner’s ‘Go Green’ initiative and AENA’s equally strong focus on environmental efforts, it is hoped the e-bus will be the first of several zero-emissions buses to enter the Spanish airport network, with Azevedo suggesting that Malaga would be the next Avipartner station in Spain to see an electric bus join its GSE fleet, which is now 34% electric across its international network. As well as producing no CO2 emissions, the e-bus operates noiselessly and for 12 hours on a single charge, with recharging expected to be necessary just once a week. Replenishing a full charge takes 1.5 hours as standard, with quick charging possible in just six minutes, enabling a range of 50 kilometres. One bus carries 110 passengers at maximum capacity. A period of trial operations will decide whether more e-buses are necessary at Seville airport. 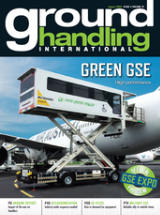 A full report of the project will be included in the June issue of Ground Handling International magazine. Technical details of the e-bus are available for download below.